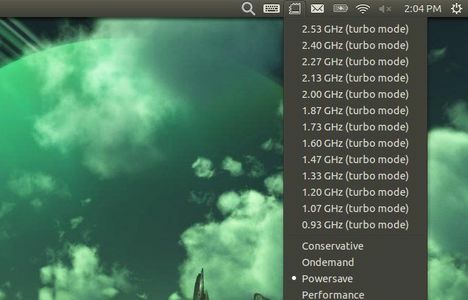 This simple tutorial shows you how to easily change the CPU frequency via indicator applet in Ubuntu 13.10, Ubuntu 13.04, Ubuntu 12.10, Ubuntu 12.04 and their derivatives, such as Linux Mint and Elementary OS. Indicator-freq is an applet for displaying and change cpu frequency on the fly. Also it allows to choose powersaving mode to save power. To install this indicator, open Ubuntu Software Center and search for and install the indicator-cpufreq package.